This threat advisory relates to an incident at the end of September where four soldiers from Fort Sill killed multiple members of the Crips street gang in a home-invasion robbery after being ripped off in a drug deal. 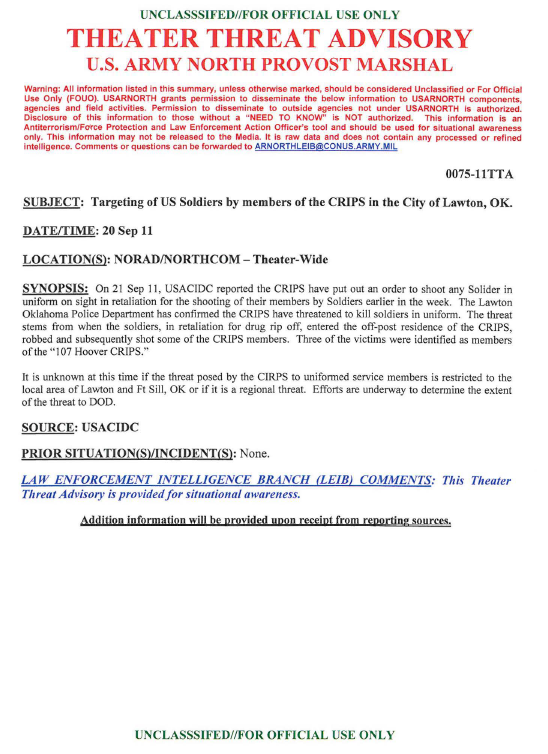 SUBJECT: Targeting of US Soldiers by members of the CRIPS in the City of Lawton, OK. It is unknown at this time if the threat posed by the CRIPS to uniformed service members is restricted to the local area of Lawton and Ft Sill, OK or if it is a regional threat. Efforts are underway to determine the extent of the threat to DOD. LAW ENFORCEMENT INTELLIGENCE BRANCH (LEIB) COMMENTS: This Theater Threat Advisory is provided for situational awareness. Addition information will be provided upon receipt from reporting sources.